The 35th Jimmy & Rosalynn Carter Work Project started out with a bang. 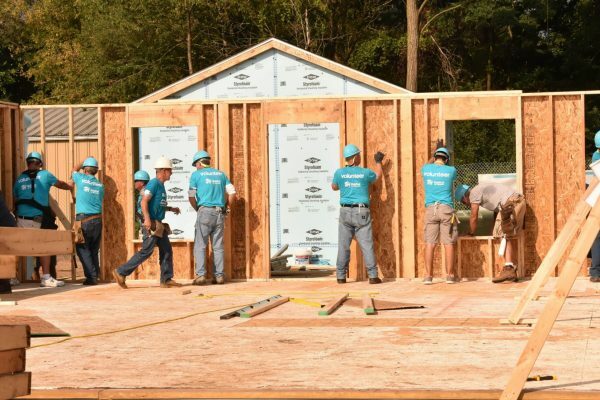 Although the weather was extremely hot and humid, 700 volunteers came together in Mishawaka on Monday Morning before the sunrise to build homes. Volunteers started off the week hearing from Habitat for Humanity of St. Joseph County CEO, Jim Williams, James Leep from Gurley Leep, and City of Mishawaka Mayor, Dave Wood. The morning continued with a memorable morning devotion lead by President Jimmy Carter and a performance of “Angels in this Town” by Country Music Singer, Eric Paslay. Alongside former president Jimmy Carter and his wife Rosalynn were special guests David Letterman, Eric Paslay, Garth Brooks, Trisha Yearwood, Mayor Dave Wood of Mishawaka and Notre Dame Womens Basketball Head Couch, Muffet McGraw. Even though their names are widely known, they volunteered right alongside hundreds of others to come together for a common goal. By the end of the day on Monday the volunteers accomplished building and assembling the exterior walls for 13 of the new homes, built and framed 13 roofs, installed exterior siding on the framed houses and installed cabinets. The site went through a dramatic change to have 13 newly framed houses by the end of the day. A 1948 Studebaker Commander was on site all day to commemorate its to history South Bend and its roots that tie back to former president Jimmy Carter himself. The Commander was President Carters first car, and he drove it cross-country in 1948!